Donna Simpson Watch Out Here Comes Susanne Eman! 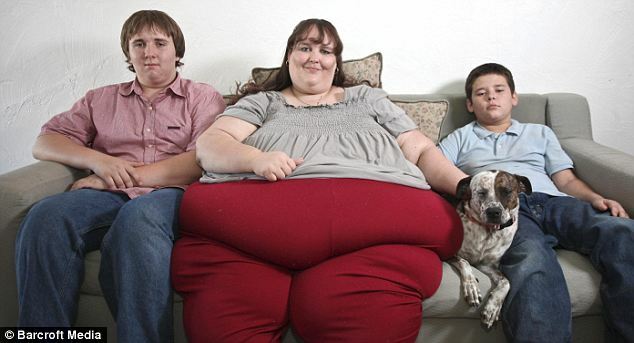 Obese model Susanne Eman is saying ‘Supersize Me’ for real – in her bid to become the fattest woman ever. 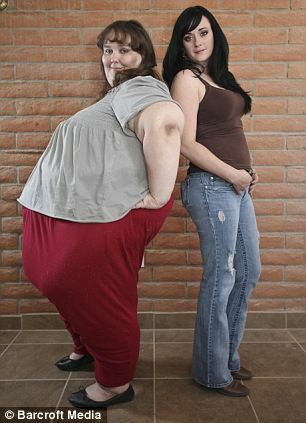 The 52-stone bombshell aims to reach a whopping 115 stone, or 1,600lb, by guzzling at least 20,000 calories a day. Susanne, 32, from Arizona, USA, hopes to pass the half-way milestone of 57 stones by the end of the year. 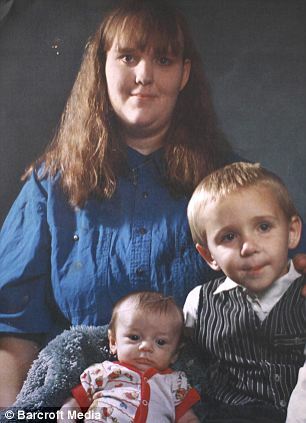 The single mother-of-two believes she’s already overtaken former biggest mum Donna Simpson, 43, from New Jersey, who weighs 50 stones. 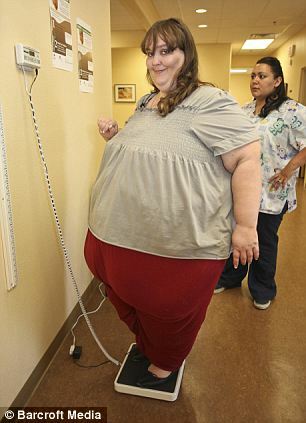 And Susanne – who is creating a stir among fans of ‘Super Size Big Beautiful Women’ (SSBBWs) – plans to increase her calorie-intake to keep gaining. ‘I’d love to find out if it’s humanly possible to reach a ton,’ she said. ‘A previous record holder was 1,600lbs (115 stone) , so I have to be at least that. ‘My next goal is to be 57 stone (800lbs) by the end of the year. 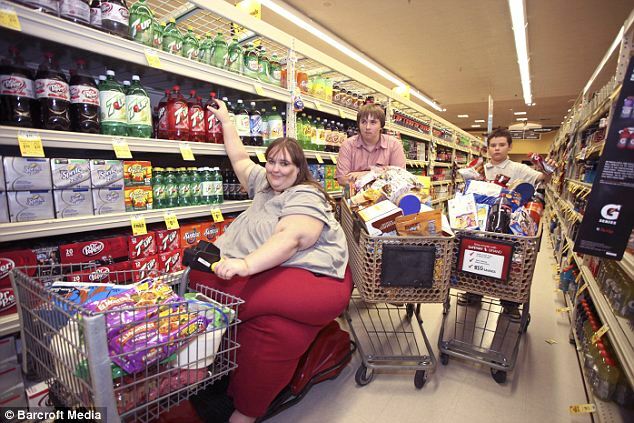 Susanne visits the supermarket once a month with sons Gabriel, 16, and Brendin, 12, and spends up to eight hours filling six trollies. ‘It’s like a full day’s work,’ said Susanne, who uses a motorised scooter, but astonishingly believes she can stay healthy. Susanne’s bizarre mission began after she couldn’t stop gaining weight naturally. ‘Two years ago I hit 35 stone because I was losing my battle against weight gain,’ she said. ‘I take my blood pressure once a week, and every day, after I exercise, I take readings of my other vitals. I use a pulse oximeter to measure the concentration of oxygen in my blood stream. ‘And I take my blood sugar levels just like a diabetic. If either of the readings go above a certain level, I’ll immediately contact my doctor for advice. ‘If I was to get sick, I’ve arranged for my sister to take care of my kids. But Susanne admitted she’s taken steps to protect her children in the future. ‘The boys do notice my diet and that I eat more each day,’ she said. Susanne even acts as an online agony aunt for other potential SSBBWs. ‘I want to break the stigma that being fat is a bad thing,’ she said. ‘I remind other fat people that it is OK for them to be that way. Breakfast: 6 x eggs scrambled, cooked in butter 468 cals. 1/2 pound bacon 1,168 cals, 4 x potatoes as hash browns 672 cals, 6 x pieces toast with butter 600 cals, 32 ounce cream shake 1,160 cals. Snacking 1 x bag of animal cookies 1,950 cals, 2litre bottle of soft drink 800 cals, 1 x 10.5 ounce bag of barbecue flavour crisps 1,650 cals, 3 x ham and cheese sandwiches 1,576 cals. Lunch: 3 x beef, bean and green chilli burritos with 1 x cup of sour cream 1,453 cals. Salad (1 head lettuce, 1 cup cherry tomatoes, 1 cup carrots, 1 cucumber, 1/2 cup ranch dressing, bacon bits, 1 cup crumbled cheese, 1 cup chicken 1,479 cals. Dinner: 12 x filled tacos + 1 x cup sour cream 4,906 cals, 2litre bottle of soda 800 cals, Dessert 8 x scoops vanilla ice cream 2,080 cals, 1 x small pan of brownies 1,200 cals. 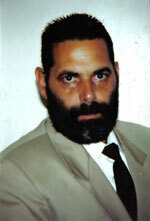 Jews Must Find A New Way To Honor The Dead.